Thank you for all of your kind words about our house. It really means a lot to me. 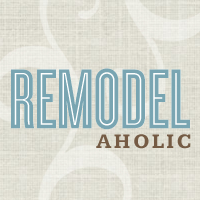 When I started this blog I was never going to show pictures of our house or tell you all exactly how we live, until recently when I have become obsessed with all of the remodeling blogs out there. I love reading others stories and seeing their before and after pictures. I have realized that we are not alone in our love for old homes and wanting to restore them. Like I have said before, we live in only half of our house right now. The other half has been stripped to the bare studs (saving that for another post) and is just sitting vacant. So right now our house consists of two bedrooms, one bathroom, a hallway, and the kitchen. Since our kitchen is the biggest room (about 18’X18′) that is where we spend all of our time. Our kitchen is not just our kitchen, it also doubles as our living room, dining room, office, craft room, playroom and even a guest bedroom with Grammy dares to spend the night. So here we go. Brace yourselves for the “then” pictures, they are REALLY BAD! When looking back at them I still can’t believe we bought this old house. I still laugh when I think about the realtor that showed us the house. The whole time she was trying to talk us out of buying this place. Most days, I think we should have listened to her. Yup, the baby was sleeping and I was not going to wake her up. Plus, there is no other place to keep her swing. The white drawers are filled with all my fabric and craft supplies. On top of the drawers is our office. If you look closely where the calender is hanging up , that is actually the doorway to go into the other side of our house. When the other side is completely finished that wall will be coming down, but for now it keeps our house clean and dust free. Yup, we have a couch in our kitchen. Well, actually that is our living room. Of course we tore down all of the walls, ceilings, horse hair plaster, blown-in insulation and the 3 layers of flooring. Ok, so EVERYTHING went except some of the main studs. Behind the refrigerator is a hallway to the bathroom and the stairway to our bedrooms. You can kinda see the kids toys are kept in a hallway (their playroom). Yes, I do love color, can’t you tell? We used to have a completely glassed in porch off the back of the house but it was so rotted and lead infested that we had to tare it down. Someday we will put another glassed in room out there. You can see the old cast iron sink that we kept, and that is all we kept from this picture. Under the sink the floor was completely rotted. Some of the main beams and floor joists were rotted as well. Ok, this was the bathroom, YUCK-O-ROO! It was actually located right behind the kitchen sink. I guess that is how they did it in the old days for plumbing reasons. And as you can guess, the floor in the bathroom was completely rotted out too. Believe it or not, we actually kept the old cast iron tub too. The inside was actually in pristine shape but the outside, well you can see. My father took the tub for us, sandblasted it, repainted it and now it looks brand new. I love this picture! You can see, we were so happy to have bought this place. What the heck were we thinking?!?! Unfortunately,, we had to keep the large beam in the middle of the ceiling. My husband built the island from scratch. Behind the doors is some major storage. This is also where we eat all of our meals. My husband and I sit on stools while the kids sit on the other side of the counter. Just recently though the baby has been joining us for meals. So I sit on the floor and feed her in her exersaucer. We don’t have room for another highchair. So there I sit on the cold floor feeding the baby. It could be worse. There is the old sink. It’s a beauty, isn’t it? I love how we did the windows. It is great cooking dinner at night while being able to watch the kids play outside. AWW yes, I fell in love with these built ins the moment I saw them. I saw the potential they had. Look at all the storage and they are so old. They have drawers, shelves and even the old pull out flour bins. They are soo cool. I worked on that old built in forever. I spent hours stripping, sanding, priming and repainting it, but it was so worth it. The inside was in good shape and all it needed was some primer and a few coats of paint. We found new cabinets to match the bead board on the old built in. I still wanted to keep the look and feel of an older country home. The little wooden shelf was covered with linoleum. What a great surprise when I tore it off and found such beautiful wood underneath. Unfortunately, we had to keep a beam that separated the built in and the new cabinets. I’m still thinking I might paint it blue to blend in more. I also would like to repaint the walls a shade lighter blue. I would like to have a little more of a contrast between the walls and cabinets. But for now it will do. The colors look so different in each light. So, there you have it, our little kitchen that doubles as a whole house. It never looks this quiet and clean though. Picture it,books and toys all over the floor. The baby rolling all over the place crying because she needs to be nursed. This momma is busy getting dinner ready while the two oldest are fighting over toys. One rides their little bike around and around in circles while the other one is chasing them. And since we are being real here, this momma is yelling because they almost ran over the baby. Yes, that is what this kitchen looks like…EVERYDAY! Here are some more AWESOME kitchen remodels! I LOVE what you have done so far! We also live in an old home (1881) which has been a remodeling project for the last 12 years. Seeing your before and after gives me hope knowing that someday my entire house will be complete. Where did you find the sink? Or what brand/year was it made? I have an off-centered sink cutout. This might fool the eye into balance.